I will start this one the same way I started the previous post. It took me some time to warm up to Hudson Yards. After all, it represents everything that is wrong with NYC dining today. Higher rents and a surging mouth shift from the mom and pop to the corporate. One doesnt need to walk too far to find available space, and the rate of closures seems to be accelerating. There’s a street on 3rd Ave between St Marks and Stuyvesant where every single retails space is available. They were all taken not too long ago. With Hudson Yards we got a little closer to Vegas. With that said, its hard to curb the Hudson Yards enthusiasm. A mega public art piece dedicated to the Shawarma (aka Vessel). Little Spain with its big names, and little balls. Jose Andres is from Asturias, so why not serve Asturian dishes that are hard to impossible to get here like Fabada and Arroz con Pitu instead of more Paella which is really just a Valencian specialty. And then there are the new Momofukus to save the day. Peach Mart, a new Fuku branch, and Kāwi – perhaps the #1 reason to go to Hudson Yards today. This is another Momofuku outpost where the cuisine is hard to describe to out of towners. Executive Chef Eunjo Park describes it as “playful” and thats pretty much how you can describe the rest of the Momofukus. 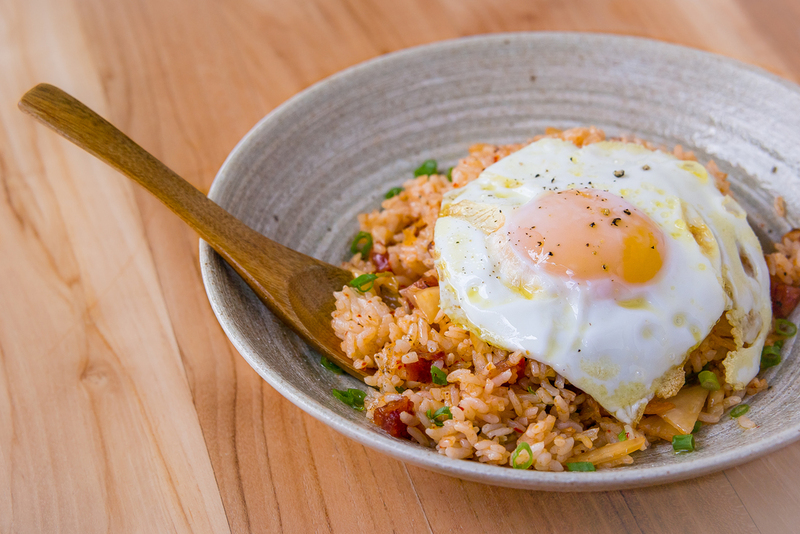 Inventive, Asian (mostly Korean) influenced lab recipes. I call it Momofunk. While this one feels more Korean than the others, the Kitchen, for the time being at least, consists of Fuku All Star Avengers, like Josh Pinsky, bringing in some of their own influences. The sweet and sour ribs, the clams – I’ve seen clips of this movie before. But while Park is getting some temporary help, this is entirely her baby. As of this writing, Kawi is open for lunch only. I cant think of any such place that started as such, but considering the location it makes sense in this case. Rumors are that dinner will include more stews and much of the same. The space is spacious and quite striking. Some of it overlooking the very open, action packed kitchen. On my fist visit, while sitting facing that kitchen, I witnessed a team of five chefs and managers closely, and somewhat nervously following a health inspector. At some point me and the inspector briefly exchanged smiles and nods, so I would like to believe I had something to do with the earned “A”. This place is cleaner than my house after cleaning. White Pepper Wings – The prototypical wings at a higher dining establishment. There’s a curious Yelp review out there urging to skip this item – “The wings are not crispy and the chicken meat is not juicy”. That could be so at that time, but what I got was pretty much the opposite. Crispy, peppery, and juicy alright. These are three whole wings, and a must get for the wing lovers of the world. Fried Cod – In a strange way, this glorified mini fish and chips without the chips might be the most memorable dish here for me. You will be hard pressed to find a flakier, more fresh-tasting, lightly battered fish. But its the gentle Yuzu spray that elevates it to the point of thinking about it many days later. Sweet & Sour Ribs – No surprise here as I’ve had and touted similar ribs at Nishi before. While its a slightly different flavor profile, this is the same fall of the bone, succulent goodness. Madai Tartare – One can live here a lifetime and not realize the importance of raw seafood (Hwe or Hoe) in Korean cuisine. Kawi has a column devoted to it. Called a Snapper but technically a prized Sea Bream, this is a firm, delicious fish treated properly at Kawi. I would opt for at least one “HWE” here. Spicy Yellowfin Tuna Kimbap (top)- If you like spicy tuna rolls, you may want to avoid this at all costs as you may not be able to enjoy them the same way again. Love that crunch from the fried Myoga (ginger) bits especially. Spicy Roasted Rice Cakes – Just like at Ssam Bar, this is yet another brilliant use of rice cakes, that come with scissors. Its topped with a good amount of crispy puffed rice, chili jam and ham that blends in nicely. While interesting, this is more of a large side dish, suited for larger groups as its big and can be a bit heavy. Dry-Aged Striploin Set – Just what dry-aged beef should taste like. Served with a Miso-like soup, an assortment of fried veggies, and delicious rice with more beef fat. BTS – One of the cocktails we tried. I wouldnt list a cocktail unless its good. Its good! Soju, honey, strega, lemon. On the sweeter side, but nicely balanced. Kakigōri – This is their version of the Japanese ice dessert. Ultra light, not too frozen shaved ice with whipped cream, ginger syrup, and pear. Like a perfected Halo-Halo. It took me a while to warm up to this one. After all, I was a fan of the previous tenant, Feltman’s of Coney Island, a hot dog joint with a story. The reincarnation of the original Coney Island Red Hots, invented by Charles Feltman in 1867. Owner Michael Quinn, packed and left about 6 months ago, and a sandwich shop now occupies the space inside the William Barnacle Tavern (a former prohibition era speakeasy) on St Marks. My level of enthusiasm needed some time to get going on this one. What can they possibly do in this tiny ‘hers and hers’ closet size kitchen? Magic apparently. The available space was ideal for Ori and Sivan who live in the same building. According to EV Grieve, they grow some of the ingredients in the garden behind the building. A Zero Kilometer Slow Food destination if you will. Maybe they even have a few black pigs roaming around the back munching on East Village acorns. How else would you explain the hard to get Culatello (Prosciutto so prized, it has its own name) that was featured one week. The rotating ingredient driven, whimsical sandwiches keeps Sivan and Ori on their toes, and fun to follow on Instagram. And their brief stint in Tokyo taught them a few tricks. It starts with the high quality bread from Pain D’Avignon which they also sell separately. The sandwiches rotate based on availability of carefully selected ingredients and to some degree… Sivan’s dreams. When she dreamt about camels, camel meat made it to the menu. When she dreamt about being attacked by angry Bisons, there was revenge in the form of Bison Heart with Tehini, pickled onions, and greens. On occasion, You may see the cleverly light “Oh Boy”, wild Argentinian jumbo Red Shrimp with homemade shrimp sauce and pickled tomato. Some sandwiches include their orange based spicy sauce that elevated Mrs Ziggy’s already fantastic chicken cutlets back at home. They sell the bottles now for $5. No matter what sandwich you select, the three to five ingredients dance together in harmony, producing a well balanced combination. But if I have to pick one sandwich its the signature Smoking Fox – Smoked Boneless Rib, Coleslaw, pickles and that zesty hot sauce. EWZ historians claim that this is the first post about a place with less than two Yelp reviews (one as of this writing). This is some strong stuff, and a lesson to us all. When you come across a seemingly low overhead business, dont dismiss it quickly. There could be a creative team behind it, that likes to dream. Its 14:30, I just finished another East Village tour, and I’m hungry. An inside peek into my head… “I still have time for Hunan Slurp before the kitchen closes for a smoke break. Or should I just get another sick sandwich from Foxface? Where exactly did I park my car? If I sprint to the car with the sandwich, will it make it or get all soggy. How do you spell mausoleum anyway? Its cold and I really feel like noodles, preferably swimming in something spicy. Ok, Tatsu Ramen it is!”. I did end up having one of the better bowls of Ramen this winter at Tatsu, called “Bold Ramen”. But the Hunanese noodle joint on the same block is where my thoughts are these days. I picked Tatsu because I’ve been to Hunan Slurp so many times lately, I’m having my Amazon mail forwarded there (yes I switched from Dell’anima after a complaint was issued). Hunan Slurp, along with Le Sia, Szechuan Mountain House and some others is leading the charge in what is dubbed by some as “Chinatown North”. A most important Chinatown that looks nothing like a Chinatown. The past five years saw an explosion of young entrepreneurs opening shops covering a variety of regional Chinese cuisines. While they are young, the kitchens are staffed with very capable, experienced cooks. And a more recent phenomenon is popular Flushing and Sunset Park joints like 99 Favor Taste, and Szechuan Mountain House testing the waters of the more glamorous East Village. Hunan Salad – This is a thing of beauty and not really “Salad” by any means. Preserved eggs wrapped in eggplant topped with pepper and dressed in soy and sesame oil. Like Baba Ganoush with makeup. A must get. Cabbage – Sounds awful. Looks even worse. Who wants to eat a plate titled cabbage? Me! After my first introduction to Chinese style cabbage at the Fei Long Market in Sunset Park I never looked back. When done right its addictive. And this one ladened with garlic, chili and soy, was one of those. Chicken – The closest dish to American Chinese, and still a good get. Stir fried chicken with young ginger. The hot plates here can seem pricey (this is $25) but they are very shareable. Pepper & Pork – Mifen (rice noodles) is the specialty here. There are all sorts of nifty combinations on the menu, and this is just one of them. Its like soup topped with a delicious juicy stir fry. Just like a mom balancing work and being a mom, a tourist in NYC needs to find the right balance between being a tourist and unleashing that inner Ziggy. After meeting so many of you on my tours (semi-shameless self promotion), and reading Trip Reports and questions on Trip Advisor, I now totally understand the struggle. You are reading this because you, unlike most visitors, understand that food is one of NY’s greatest attractions, that often doesnt play well with other attractions. In fact they really hate each other. Sometimes, something will have to give, but it can result in a much more enjoyable trip. Here are 10 rules to help you strike that balance, and avoid tourist traps. The Gotham West Market’s executive in charge of luring interesting new vendors must have one of the toughest jobs in America. It turns out that surviving so deep inside Hell’s Kitchen, a neighborhood dominated by young professionals and Bulldogs is pretty tough. Ivan Ramen Slurp Shop is the only original vendor left since they opened about 5 years ago. Changes are happening in a furious pace. Latest shocker is the departure of Genuine Roadside, a burger joint owned by Avroko the firm that designed GWM. Sources tell me Corner Bistro another burger joint will be its replacement. Yes, I have sources. For a moment there, with the shuttered burger option, GWM’s total demise seemed in sight. I mean how much more pain can these Bulldogs take. Enter Dell’anima! Yes, that Dell’anima that you may have heard about but never went because it got lost in the crazy West Village Italian shuffle. It managed to survive a decade there generating quite the following, but ultimately succumbing to ultra gentrification like so many others. Today’s rent squeeze means you have to be creative with the real estate, but it also means winners may emerge elsewhere. In this case its Hell’s Kitchen which may have just gotten its best Italian. I’ve been hanging around so much at Dell’anima lately (before or during tours) that I’m having my mail forwarded there. It replaces the space of El Colmado, joining Ivan, Seamore’s, Corner Slice, Ample Hills Creamery and a Jianbing joint (Beijing style crepes) as the current residents. A very different lineup to even going back a few months, not to mention on opening day. Dell’anima features the type of concentrated menu that feels fresh and unique in the entire Hell’s Kitchen universe where Italian is somewhat lacking. And I can safely say this again: Gotham West Market is a solid, severely overlooked pre-theater option. At least for the time being. The mostly Roman inspired pastas here is the main draw although everything else I’ve tried was exceptional. There’s a Tajarin Carbonara with Speck and egg that is so good I had to come back for it when I didnt have to share it with three women (My family. I’m not THAT popular). The Tagliatelle Alla Bolognese was another winner. There’s also a Tagliolini Cacio e pepe and a standard but fine looking Orecchiette with sausage. Only two Secondis on the menu, and at least one of them is superb. A chili crusted, juicy Pollo al Diavolo sitting on top Broccoli Rabe. The charred octopus, a popular dish in the previous location is excellent as well. It comes with “Rice Beans”, cannellini Beans so young they resemble large grains. While not one of these fat Spanish octopuses you come across sometimes, its zesty and delicious, and the dish works well as a whole. Go! EV Bites is a monthly feature (well sort of. I may have skipped a few), that showcases five places in or around East Village you should know about. I will occasionally extend the border to surrounding hoods and maybe even mention a name more than once. East Village in case you are not aware is an incubator for top industry talent, and a goldmine of world cuisine. Foxface – The smallest kitchen in the village keeps attracting the most interesting stuff. Inside the William Barnacle Tavern/Theater 80, out goes Feltman’s Hot dogs, the rebirth of the inventor of the hot dog (or Coney Island red hots) and the best hot dog in NY. In goes Foxface, the little Sandwich shop that could. It took me a couple of months to try it, because that’s how long it takes me to get excited about a sandwich shop, but man was it good. One bite of the well crafted, balanced Smoking Fox (smoked boneless rib, coleslaw, pickles, homemade spicy sauce) is all you need to understand. Its owned by a duo that used to own a cafe in Tokyo. Quite the ingredient driven little place, starting with the bread they get from NYC’s elite like Pain D’Avignon and Fat Witch. Hunan Slurp – Possibly the most important opening out of the countless of Chinese openings over the last few years. Half of my meals in the area as of late are here. A fresh Z-list addition. Cant say enough. The incredible whole fish, the cabbage, stir fried chicken, Hunan Salad, and the signature Hometown Lu fen. I will have a dedicated post when the time comes. La Rossa – Hate the generic sounding name, love the pizza. This is from yet another Italian pizza legend, Stefano Callegari who owns some of Roma’s best and the inventor of the Trapizzino. We are just missing Bonci (Interestingly he owns two in Chicago). I like to start my pizza relationships with a light no frill meal which means a basic Margherita, and this one did not disappoint. Although from Rome, its more Neapolitan-style featuring a light and airy dough with great ingredients all around. But the pizzas to get are most likely the Roman inspired Carbonara and Cacio e pepe baked with ice in order to “glue” the ingredients better. Technically just inside Soho on Lafayette. Dunhuang Noodles – Its getting to the point where its hard to limit this feature to just one Chinese, but they are all so very different. Dunhuang specializes in Northwestern Chinese food, and is growing a la Xi’an Famous. In the winter I usually crave spicy noodle soups, and very few in the area beat Dunhuang’s Braised Beef Noodles and Lanzhou Beef Noodles these days. Patisserie Florentine – Is no more! That group from Canada that makes the semi-annual pilgrimage to Patisserie Florentine after pre-ordering ALL their Almond Croissants will soon get the painful truth just like I did. Only in East Village a place with a perfect Yelp score offering a legend-esque product can still close. I’ve watched these Almond Croissants make countless of people smile over the years on my tours. But hey, its East Village. There’s plenty of fish in this sea.